I would strongly recommend going to the outback esp N.T. 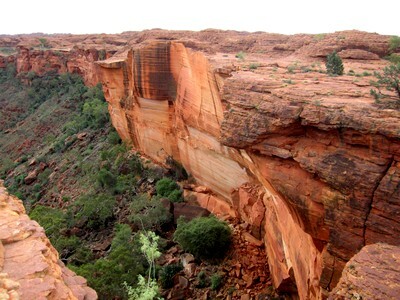 to visit Kings Canyon and try do the 6 km hike early morning. We started off at 5:30 am and there were absolutely no one around and enjoyed the peace and quiet. But we could hear the sounds of nature - wind, leaves, some creatures moving around (but we didn't spot a single snake even though the information site did mention that there are "worna pythons" around). It was an absolute treat to our ears. Our hike was made even more special when we saw the sunrise over the canyon, throwing a bright orange colour over the rocks..wow, simply stunning! A tip : Do not lose track of those blue markers, we kinda got lost taking photos but got back on track soon!! It's easy to go off the marked trail. I will definitely visit the Kings Canyon again. I agree that this is one of the best tourist walks you can do in central Australia. Join in and write your own page! It's easy to do. How? Simply click here to return to Outback Travel Tips.